This year started with the annual PFA Away evening which takes the members to vials locations and museum in the area. This year was a great evening out to the RAF Regiment Heritage Centre at RAF Honington. Here we visited the Memorial Gardens, Gate Guard and the Museum where a lot was learnt about what the RAF Regiment do in their day to day role. We also learnt about some of the past deployments they have done and a lot about the history of them. A very well recommended visit. Following a superb traditional Christmas meal, Chairman John gave a rousing speech and announced the winner of this year's John McCleod Trophy to Richard Flagg. Richard has served on the PFA committee for many years, practically never misses a meeting and is reliably enthusiastic, positive and kind. He runs the PFA website and even pays for the domain renewal, himself. Richard has developed the internationally renowned website: “UK Airfields” covering airfields, memorials and aircraft in the UK. He's a fully-fledged aviation enthusiast who's as good at listening as he is at talking. 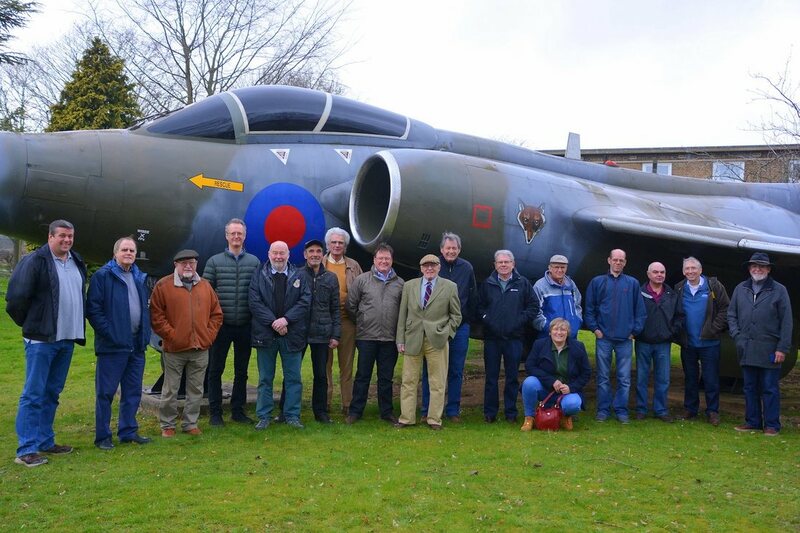 Each year, he organises the April PFA members trip, utilising his wealth of aviation contacts and knowledge. Richard gives a great deal to the PFA and its membership despite neither having an aircraft or pilot's licence. He's an all-round, good egg. 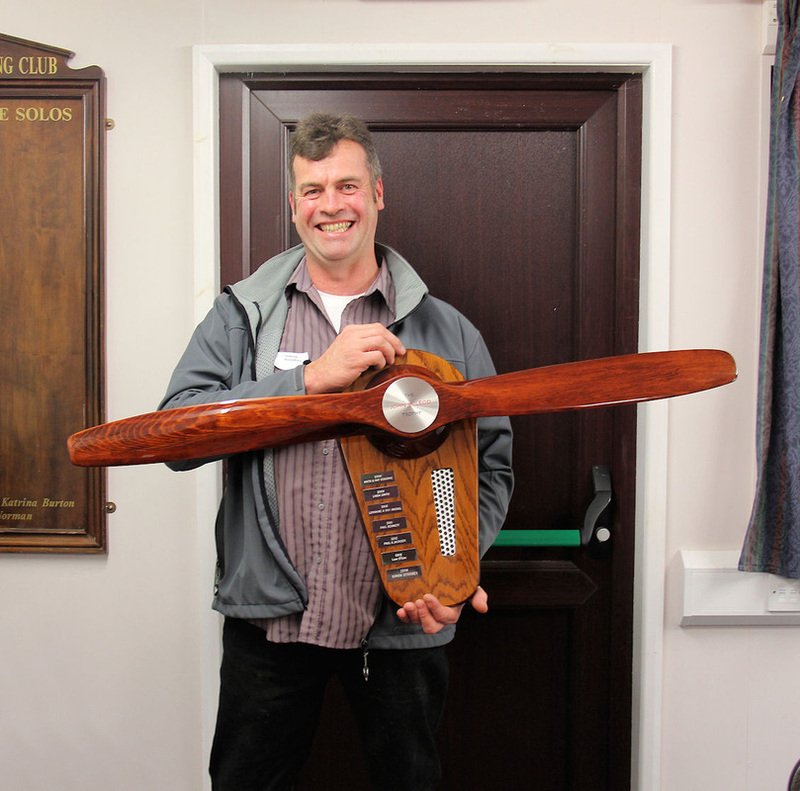 ​The winner for 2016 john McLeod Trophy is Chris Barnes for his inspired building of Chilton DW1A G-DWCB, first flown at Priory Farm on 31 August 2016. It is no mean feat to construct an aircraft from a kit of parts, and we raise out hats to those who take the time to assemble aeroplanes from the providers of some of the better kits on the market. ​We raise our hats — and, additionally, give thanks to providence for our own salvation — when we see fellow aviators wrestling with an ill-fitting selection of pieces supplied by one of the less helpful kit manufacturers. What can we do except gape in admiration at the home constructor who carries a tree into his workshop and emerges years later with an aeroplane — and one constructed to the highest standards of workmanship, too? Chris kindly took time out to give an illustrated talk to the February 2016 PFA meeting. Informative though the talk was, the following question time was lengthy, as members sought further detail of what they had seen on the slides. Without doubt, all were interested and impressed. But even the worst kits are still kits. Chris started from basic materials and a set of plans for what is, hardly, the world’s best-engineered aircraft. And he succeeded. Just once he needed to cheat — when rudder control cables were fouled by a fault with one of the rear fuselage frames and he had to chop a small piece out of the frame to restore free movement. At a later juncture, he had the opportunity to ask a judicious question of an owner of one of the pre-war, production-line- built DW1s. He hadn’t made a mistake: The original designers and builders had to cut a bit out of that frame, too! There is doubt whether the sight of Chris’s DW1A flying out of Priory Farm will inspire other members to undertake their own scratch-build projects. However, that is their loss. Chris has shown the way and we honour him for demonstrating to us what is possible in the realm of light aviation. 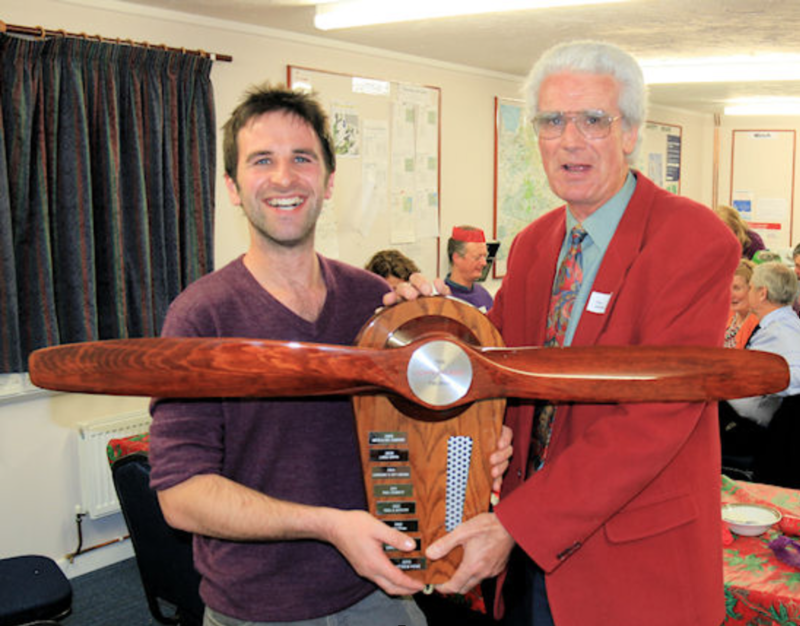 ​At this year’s Christmas meeting of the PFA, the annual award of the john McLeod Trophy was made to Matthew Howe for his contribution to light aviation — specifically for reminding us that an occasional excursion to Fenland (even for a slice of the excellent cake available there at the weekends) does not make a Charles Lindbergh out of us. Only by chance did I overhear a remark, some months ago, that Matt had made more than one visit to the Continent this year. And, on further enquiry, it emerged that two of those trips were within a week. Planning and paperwork may deter some of us; and that 22 miles of water is a powerful disincentive to others. But some of you will know that Matt flies a flex-wing trike! Congratulations to Matt for his prowess and modesty in exercising his aviation skills and reminding us that our N/PPL is there to be used while finance and health still permit. Go for it while you can — and thanks to Matt for showing us how it can be done. PICTURE: Matt Howe (L) receives the John McLeod Trophy from the Chairman for inspiring PFA members to get more out of their flying in the year ahead. Congratulations to Simon Stoodley for his achievement in winning the John McLeod Trophy for 2014. This was presented at the Christmas meeting on 1 December and, as our Chairman said at the time, it very nearly was not awarded at all, because Simon has been backward in coming forward regarding his achievements. The trophy is for ‘contributions to light aviation’, in this case recognising several long-distance, overseas flights Simon has made in his Skyranger without fuss or fanfare — and is also awarded ‘on account’ for more which may be in the planning stage. Speaking of which, we understand from the reports of others that Simon’s gung has never been hoed, and that he is always meticulous in both his planning and flying. All in all, Simon has set an excellent example for us to follow, inspiring us to get more enjoyment and safe adventure out of our flying.